Clyde Smith knew what to do when the green light came on in the plane over Normandy in the early hours of June 6,1944. He would jump out behind the man in front of him, land, pull off his parachute and assemble the regiment to cover a nearby bridge so engineers could destroy it. But that was in training, with­out flak zinging through the air and bullets blasting through the bottom of the plane. "The planes should have slowed up to about 100 miles an hour for a jump, and I think they were going about 125," said Smith, who was a scout for the 508 Parachute Infantry Regiment of the 82nd Airborne Division. "Our plane was hit right before we jumped. Machine gun bullets came up through the bottom, and when we stood up to jump, shrapnel went up through right behind my platoon leader standing in the door. A piece went through the wing too, and that's when we jumped." "People ask you is it hard to shoot someone. But when you see the fellow you're going to shoot, you're shooting the enemy.... It's easier for you when you see one of your buddies get killed. It makes it easier to shoot back. me and gave me a kidney punch with a rifle." Smith was captured and loaded onto one of eight trucks filled with prisoners of war. As the trucks moved out, six British and American airplanes flew over and shot at them, not knowing allied prisoners were aboard. About 40 prisoners were killed, he said. In the next 10 months, during which time his wife presumed he was dead, Smith was taken from town to town to dig ditches and lay water lines. He rode a "hell train" so packed with prisoners that he couldn't move at all, and he was never given breakfast. The prisoners received only a bowl of soup at noon and a piece of bread at night. In April, Smith and some other prisoners were being taken to Czechoslovakia when they over­powered the German guards and escaped. They grubbed for potatoes to survive and eventually linked up with an American convoy who helped them get to France. Smith finally got home in July. 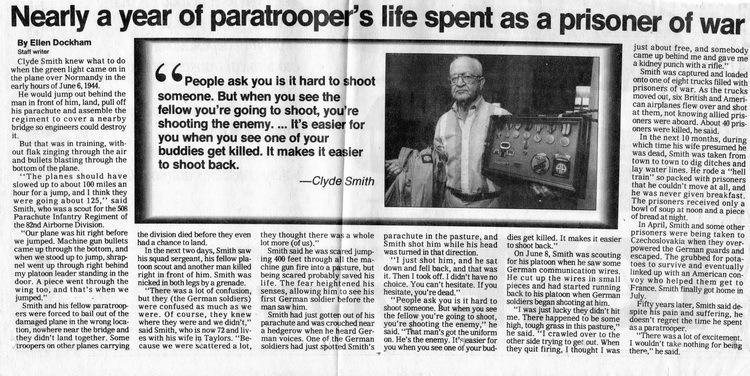 Fifty years later, Smith said despite his pain and suffering, he doesn't regret the time he spent as a paratrooper. "There was a lot of excitement. I wouldn't take nothing for being there," he said. land together. Some troopers on other planes carryingthe division died before they even had a chance to land. In the next two days, Smith saw his squad sergeant, his fellow platoon scout and another man killed right in front of him. Smith was nicked in both legs by a grenade. they thought there was a whole lot more (of us)." Smith said he was scared jumping 400 feet through all the machine gun fire into a pasture, but being scared probably saved his life. The fear heightened his senses, allowing him to see his first German soldier before the man saw him. while his head was turned in that direction. "I just shot him, and he sat down and fell back, and that was it. Then I took off. I didn't have no choice. You can't hesitate. If you hesitate, you're dead." "People ask you is it hard to shoot someone. But when you see the fellow you're going to shoot, you're shooting the enemy," he said. "That man's got the uniform on. He's the enemy. It's easier for you when you see one of your buddies get killed. It makes it easier to shoot back." On June 8, Smith was scouting for his platoon when he saw some German communication wires. 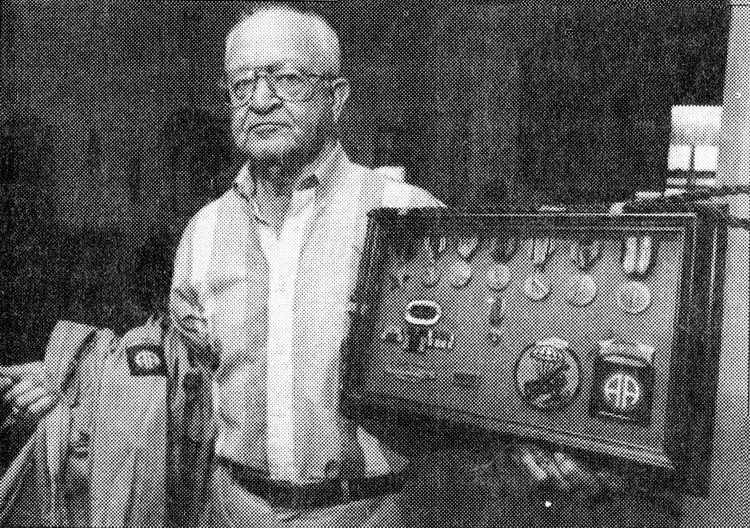 He cut up the wires in small pieces and had started running back to his platoon when German soldiers began shooting at him.